Hi Guys- how was your weekend? We laid very, very low. After being pretty sick here for 10 days, we headed out on Saturday for an hour to get a bite at our local Greek festival (we were no longer contagious- I swear!!) and it was like I had to adjust my eye’s to the bright light! I honestly have only left the house to go to the dr or pick sick kids up at school. Good Times. SO happy to be feeling normal- it makes me realize how much I take good health for granted. So it was nice to get out on this beautiful Sunday afternoon and get fresh air and enjoy the Autumnal Sun which is setting much earlier all of the sudden. And then of course I settled in to make Sunday dinner and binge watch Anthony Bourdain all evening. I made Pomegranate Laquered Chicken and then on the side I made this Spiced Apple Cider and Sweet Potato Quinoa Bowl. It was a gorgeous complementary dish but this is so much more than a just a side dish. It is also a Meatless-Monday-perfect-for-lunch-or-dinner Quinoa Salad bowl. I would easily eat this as meatless meal for dinner- but also think it would be awesome to bring to work for lunch. What I love about this dish is that the quinoa is actually cooked in the Spiced Apple Cider, so the grain is completely infused with the apple and spices flavors. When it is tossed with the red onion and the parsley it takes on sweet and savory notes that I really like. 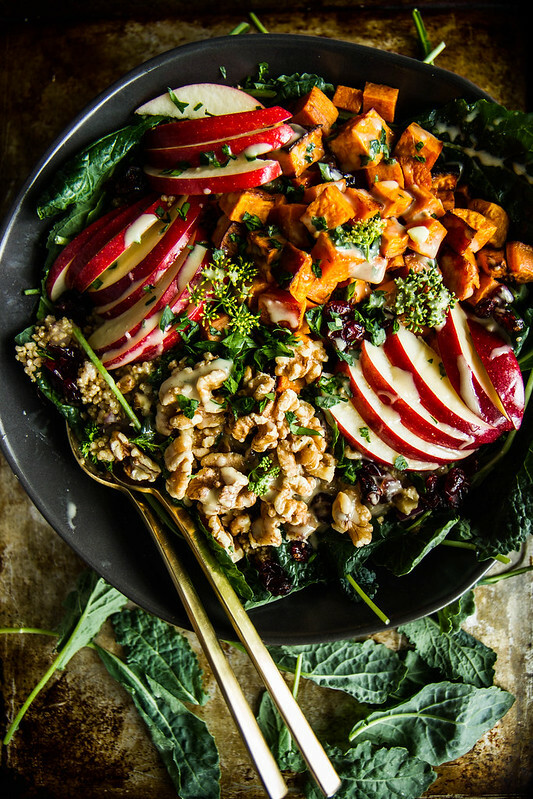 The roasted sweet potatoes have that same quality and the sweet and tart cranberries and apples and toasty walnuts add so much texture and flavor! A nest of baby kale (we are still producing in our garden!) is a grassy wonderful addition and then the Apple Cider Dijon Vinaigrette is what I like to drizzle over the top for an extra explosion of flavor. Enjoy! In a small pot, add the apple cider and the quinoa and kosher salt. Bring to a simmer over medium heat and add the lid. Reduce the heat to low and simmer for 20 minutes. Toss the sweet potatoes with 3 tablespoons of oil and kosher salt and roast on a bare sheetpan for 17 minutes until golden brown and tender. To make the dressing, combine the garlic, Dijon, apple cider, apple cider vinegar and olive oil and puree until smooth. Season to taste with kosher salt. When the quinoa is finished, fluff with a fork and let cool slightly. Toss the quinoa with the red onion, dried cranberries and parsley along with a few tablespoons of the dressing. Season to taste with kosher salt. 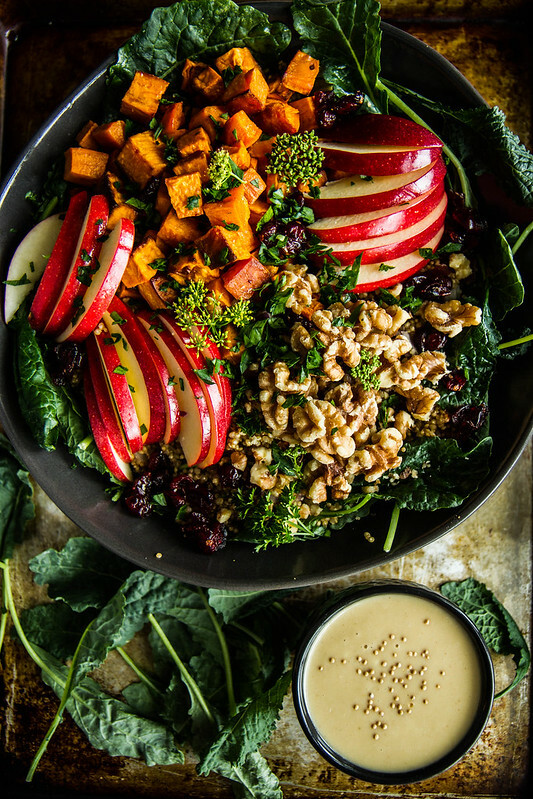 On a bed of baby kale pile the quinoa and then arrange the roasted sweet potatoes, apples and walnuts on top and drizzle with the dressing. These bowls are beyond fab, love the colors! Glad you all are feeling better! So glad to hear you are feeling better. This salad is on POINT! I love all the flavors going on. Glad you guys are feeling better and made it out the to festival!! This salad is GORGEOUS!! I love the colors and all the Fall flavors! What a great salad to celebrate fall. Will be trying quinoa cooked in apple cider. We are obsessed with everything apple cider and pumpkin these days. this is all the good fall things thrown into one! I love cooking quinoa in liquids other than water to give it a different taste. Also, this Pomegranate Laquered Chicken is something I totally wanna see! 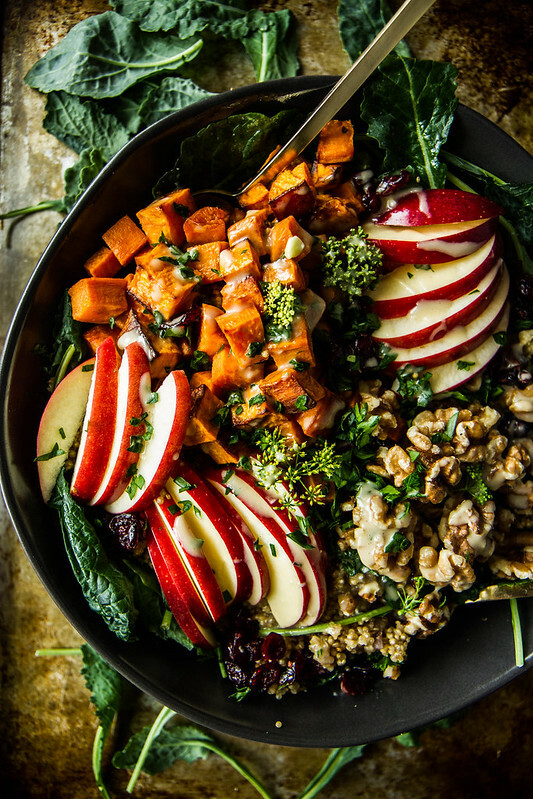 What an unbelievably perfect fall bowl!! So yummy! Im pretty sure I could eat this for dinner every single day! this dish was made for me! HI there, I’m very interested in this recipe but hesitant to be cooking with quinoa for environmental and ethical reasons. Do you have any suggestions for a substitute? The quinoa refused to cook with the sparkling apple cider I used. Next time should I use spiced cider that’s uncarbonated? YES! oh no!!! I am so sorry- yes- it’s just plain apple cider not sparkling apple cider. You could use plain apple juice too. Hi, this sounds really good. However I am unable to locate apple cider vinegar, and Apple Cider Dijon Vinaigrette. Would you be able to stir me in the right direction? Thank you in advance. Hi Dee- apple cider vinegar should be at every grocery store- just look in the vinegar section or ask at your local store. And the Apple Cider Dijon Vinaigrette is the name of the salad dressing, who’s ingredients are listed below the title. I changed the formatting a little to make it less confusing. thank you! What a creative and delicious combination! Thanks Heather. I have emailed you to ask your permission to share. Look forward to hearing from you.